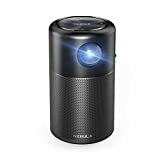 Portable pico projectors for smartphones are a dime a dozen these days, but you’ve never seen anything quite like the Nebula Capsule Smart Mini Projector by Anker. This isn’t just a portable projector, it’s a full-fledged portable home theater that’s stuffed into a device the size of a soda can. It can beam a nice clear picture onto any wall or screen, and it has built-in 360° sound so you don’t need separate speakers. It also connects to your iPhone or Android device wirelessly, so you don’t need to carry any cables! Amazon’s current sale drops the price of the Nebula Capsule to its lowest price ever when you use the coupon code 4CAPSULE at checkout. Definitely grab one at this price while you can.